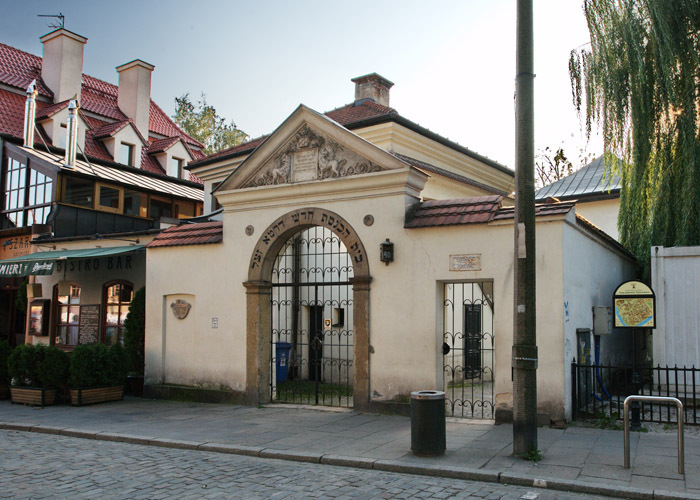 All of the synagogues in Krakow are located in the Jewish Quarter in Kazimierz. The Jewish community in Krakow had been living in Kazimierz for centuries, creating one of the most vibrant Jewish centres in this part of Europe. After World War II the Jewish Quarter was completely devastated and had been neglected for years. Recently local communities and authorities have made an effort to restore Kazimierz to its former splendour. The Jewish Quarter is once again a bustling part of the city, welcoming not only Jewish tradition but also becoming a heart of the bohemian life in Krakow. Seven synagogues remained preserved after World War II. Since the Jewish community almost entirely perished during the war, for many years there has been no Jewish people to cultivate their tradition in Kazimierz. The synagogues are the most important reminders of the Jewish community that once had lived in Kazimierz. The Izaak Synagogue holds the name of its founder, Izaak Jakubowicz, sometimes called Izaak the Rich. He was a merchant, president of Kazimierz Kehilla and a banker to Polish King Wladyslaw IV. 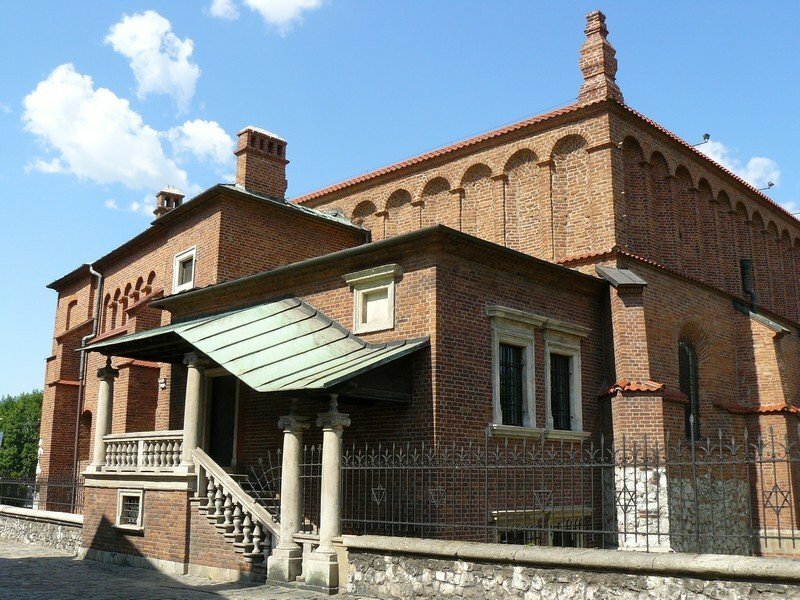 The synagogue was built in 1644 and constructions were led under the eye of Giovanni Trevano, an Italian architect working on the royal court. A small reconstruction was carried out only in the 19th century, moving the main entrance from the south to the western facade. In 1924 two-speed stairs and central arcaded porch designed for women was built. During World War II, the Nazis led to a significant devastation of the interior of the synagogue and irreversible loss of its valuable equipment. Shortly after the Nazi invasion, the Jewish official on duty, Maximilian Redlich, was shot dead at the doors to the synagogue after he refused to burn the scrolls of the Torah. After the war, there were plans to move Catholic Church into the synagogue, but eventually, it had served as sculpture workshop for Association of Polish Artists. In the 1970s the building was abandoned, slowly turning into a ruin. In the 1990s the synagogue was given back to the Jewish community of Krakow and since then the restoration works have been conducted. The Izaak Synagogue is not active these days, but it houses a video/photography exhibition titled “In Memory of Polish Jews“. A small restaurant serving traditional kosher food is located in the back of the synagogue. The synagogue is also a venue for regular concerts of klezmer music. Sunday – Thursday 8.30 a.m. – 8 p.m.
Friday 8.30 a.m. – 2.30 p.m. It is one of the oldest Jewish establishments in Kazimierz, built at the turn of 14th and 15th century, as a result of the Jewish community of Krakow moving to Kazimierz. Until 1939 it was the heart of Jewish religious, social and political life in Krakow. One of the most important events in the history of the synagogue was a fiery speech delivered by Tadeusz Kosciuszko, Polish national hero, who urged Jewish community to fight for the freedom of the common homeland. In 1846 a Jewish activist and a participant in the Krakow Uprising, Maurice Krzepicki also delivered a patriotic speech here. In 1848 rabbi Dow Beer Meisels did the same during the Spring of Nations. In 1557 a great fire consumed the entire synagogue. The reconstruction works turned the Synagogue into an original Renaissance edifice with preserved Gothic shape and interior. In the 19th century, the Jewish community decided to carry out renovation of the synagogue. Unfortunately, ransacked by the Nazis in World War II the synagogue was left completely devastated for years. In 1961 the Historical Museum of Krakow took possession of the Old Synagogue and turned it into one of the branches, focusing on the history of Polish Jews. Monday 10 a.m. – 2 p.m. 10 a.m. – 2 p.m.
Tuesday – Thursday 9 a.m. – 4 p.m. 9 a.m. – 5 p.m.
Friday 10 a.m. – 5 p.m. 9 a.m. – 5 p.m.
Saturday, Sunday 9 a.m. – 4 p.m. 9 a.m. – 5 p.m. The Tempel Synagogue was built in 1862. It served as the main venue for Reform Jews who tended toward cultural and social assimilation with the Polish nation. Devotions were held based on the nineteenth-century reformed liturgy and the preachers were mostly men with an academic background. Once a week, there were sermons preached in Polish and German. The synagogue had also a women’s choir in the 1920s and 1930s. Just like every other synagogue in Kazimierz, it was devastated during World War II and used as a warehouse. After the war, it welcomed prayers again and the services were held regularly until 1985. Thanks to large donations from Jewish associations from all over the world, the Tempel Synagogue underwent a vast renovation in the late 1990s. Its original exquisite interior and a breathtaking golden ceiling have been restored. 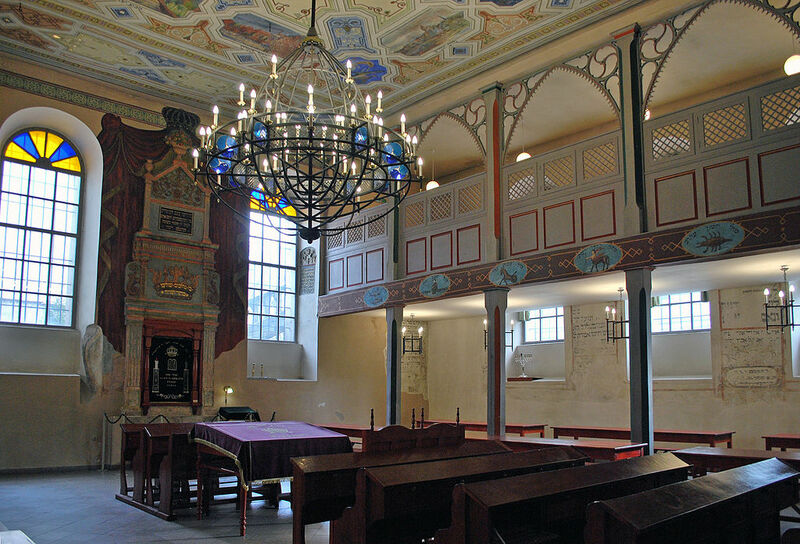 Today the Tempel Synagogue is one of the active synagogues in Krakow, the only one of Reform Judaism. However, services are held only from time to time, for example during the Jewish Culture Festival. Adjacent to the synagogue is the headquarters of the Jewish Community Centre of Krakow. Sunday – Friday 9 a.m. – 6 p.m.
* Please note that the Tempel Synagogue is an active house of prayer so while visiting, a kippah or other headgear should be worn as a sign of respect. The Remah Synagogue was erected around 1558 next to the Jewish cemetery. Its founder was a merchant and a royal banker, Israel Isserles Auerbach. He built it for his son – a scholar and the Krakow Rabbi, Moses Isserles, commonly called as Remuh. He was an internationally famous writer and was considered to be a miracle maker. Remuh was buried in the adjacent cemetery and each year, his tomb attracts pilgrimages of devout Jews. The Jewish cemetery dates back to the 16th century and is one of the oldest in Europe. During World War II the synagogue served as a storehouse of firefighting equipment, the interior has been therefore destroyed. Despite all the devastation, there is an original late-Renaissance Aron Kodesh (Torah ark) preserved in the eastern wall of the synagogue with Art Nouveau doors. The building itself remained untouched. 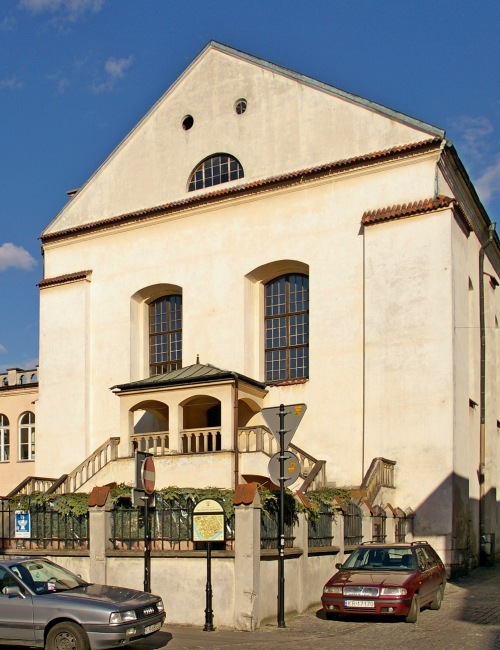 The Remah Synagogue is the only synagogue in Krakow where regular services are held. It is the main venue for orthodox Jews. * Please note that the Remah Synagogue is an active house of prayer so while visiting, a kippah or other headgear should be worn as a sign of respect. The High Synagogue was built between 1556 and 1563 and it has been the tallest synagogue in Krakow ever since. The founder of the synagogue is unknown. Probably it was one of the rich Jewish merchants. Hypothetically, the synagogue could also have been founded by Jewish immigrants from Venice, since the building resembles Italian synagogues. Undoubtedly though, the founder decided to construct a prayer hall on the upper floor over the shops on the ground floor of the original building. Such realisation could be caused either by safety reasons (the synagogue was located in a busy area, near the gates to the Jewish Quarter and Catholic neighbourhood), or because of restrictions regarding urban planning. The High Synagogue was the most devastated by Nazis amongst all Kazimierz synagogues during World War II. The building was completely destructed after the fire that was probably a result of the explosion of a grenade thrown into the building. The only piece of equipment that survived the war is the 17th-century Baroque Menorah, which was hidden at the Wawel Castle during the war. Currently, it is on permanent exhibition in the Old Synagogue. At present, the stone Aron Kadesh is the only remaining element of the original interior of the synagogue. Sunday – Thursday 10 a.m. – 6 p.m.
Friday and Saturday 10 a.m. – 7 p.m. The Synagogue built in 1620 was founded by Wolf Popper, an extremely wealthy banker from Kazimierz and one of the richest people at that time in Europe. 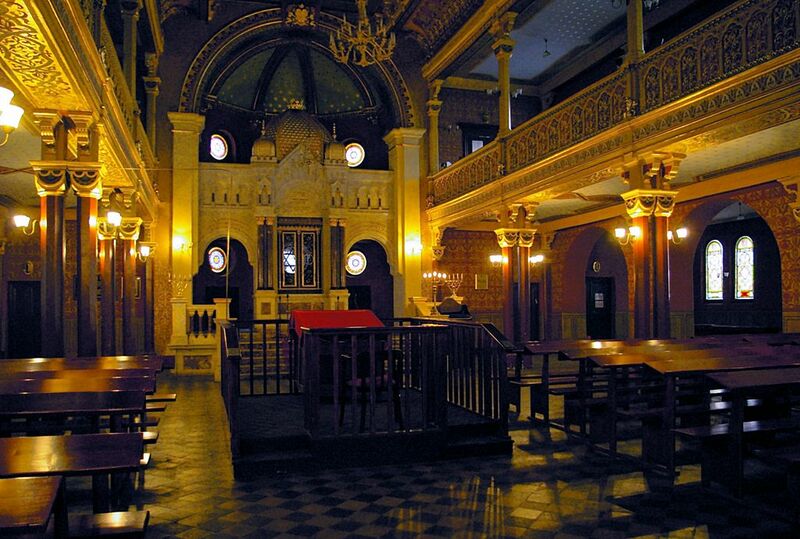 Popper founded the most exquisite interior in all of Kazimierz synagogues. The synagogue was so sumptuous that when Wolf Popper died, the high costs of maintenance led his heirs to almost bankruptcy. Therefore, the Krakow Jewish community took over the synagogue and did not care as much for keeping original splendour of the interior. 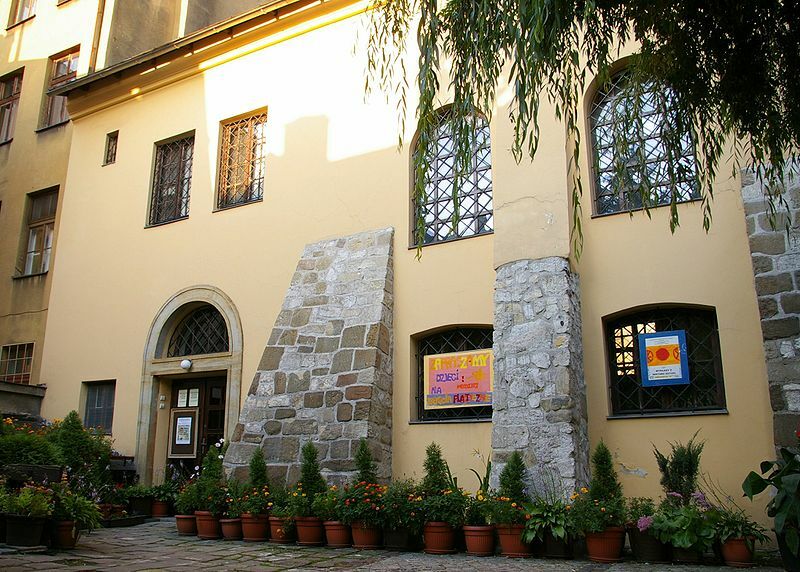 Originally, the synagogue was located at the back of the Popper’s family house on Szeroka Street and its eastern wall was adjacent to the city wall. In 1827 the synagogue underwent a general reconstruction and a gate closing the inner courtyard was built. Events of World War II left the synagogue devastated and none of its original rich equipment or interior survived to this day. In the result of the 1960s restoration works, the building was adapted to be a secular place. Since then the former Popper Synagogue has been a house for the Youth Culture Centre. The synagogue was built in the 1640s thanks to donations from craftsmen, small traders and goldsmiths (kupat-cdaka in Hebrew means a can for alms-giving, hence the name). The synagogue is sometimes called Hospital Synagogue or the Synagogue of Poor because it was attended almost only by the poor and patients from the neighbouring hospital. The northern wall of the synagogue was adjacent to the medieval city wall of Kazimierz. Originally the synagogue level was about 80 centimetres lower compared to the current level of the floor, which means that the synagogue was entirely hidden behind the wall and between other buildings. In the 18th century when the city wall ceased to serve its purpose, the synagogue was rebuilt, rooms for the poor members of the Jewish community was added and a small garden was established in the backyard. Following the destruction during World War II, the synagogue has been meticulously restored. 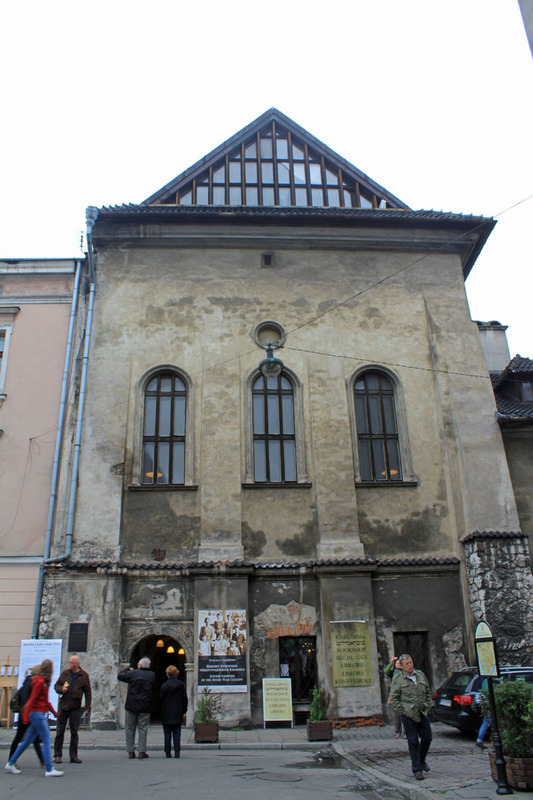 Currently, Kupa Synagogue is the centre of the religious life of the Jewish community of Krakow. Every Shabbat services are held and on Friday evenings there are dinners for members of the community.